Delhi, the capital of India, is situated in northern India and stands on the west bank of Yamuna River bounded by Uttar Pardesh and on the north, west and south by Haryana. Delhi is spread over an area of 1483 sq. kilometers, 216 meters above sea level and has a population of around 14 million. The city has its historical importance for the fact that it has been the home to Mugal Empire. Delhi, as described by the famous poet Mirza Galib, is "The world is body and Delhi its soul". Apart from its historical importance, Delhi also happens to be the political hub of India, where every political activity in the country traces its roots to Delhi. As per the study and sources, the name Delhi originated from the Persian word Dahleez (threshold or frontier) or from the name of a Mauryan king, Raja Dhillu. Another possible etymology is the city's original name Dhillika. The people of Delhi proudly call themselves as "Delhi-ites". A lot of pride is associated with this word. Delhi is the fifth most populated urban area in world with satellite towns like Faridabad, Gurgaon and Noida making it a NCR, called the National Capital Region. NCR was developed because Delhi needed room to expand and bear the burden of increasing growth and development in the region. Delhi not been able to satisfy the need of this very demand, sought the potential of neighboring cities like Noida and Gurgaon. Today, Noida and Gurgaon are closely associated with Delhi and the immaculate infrastructure makes the commuting among these cities an easy ride. The history speaks the importance and contribution of Delhi towards developing India as a country which has left its mark on the global map today. 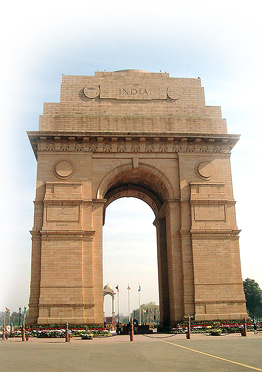 Delhi has the most effervescent history among other prominent cities in India. Study from the Archaeological Survey of India states that Delhi was the capital of seven empires in Indian history and has over 60, 0000 recognized monuments built over several millennia. Well, it is also becoming the major Information Technology destination of India. According to reports, Delhi and NCR accounted for maximum software export from India. IT and ITES have found their place in Delhi and NCR, where the infrastructure provides conducive environment to make the industry flourish like never before. All major multinationals like IBM, Microsoft, Google, Sony, etc have their offices in Delhi and NCR. Delhi is the symbol of old and new India, an India which is growing rapidly and catching up with the global business demand. Our late Prime Minister, Jawahar Lal Nehru, proudly said, "Delhi is the symbol of old India and new? Even the stones here whisper to our ears of the ages of long ago and the air we breathe is full of the dust and fragrances of the past, as also of the fresh and piercing winds of the present"